It would be fair to say that we take a lot of mankind’s greatest achievements in the field of engineering for granted. Millions of people, for example, use the Channel Tunnel each year, whilst 125,000 motorists cross New York’s Brooklyn Bridge every single day. But how many users of these incredible pieces of infrastructure ever actually stop to think about the mammoth amount of work and extraordinary intelligence that was needed to bring such ambitious ideas to fruition? In this guide, we will take a look at how the world’s most impressive engineering projects – from the ancient to the modern day – came to be so ground-breaking, vitally important or simply awe-inspiring. The first recorded suggestion of a tunnel linking France with Britain can be dated all the way back to 1802, when the French mining engineer Albert Mathieu-Favier proposed the idea. Mathieu-Favier suggested that the finished structure would be lit by oil lamps and benefit from an artificial island being constructed halfway across the Channel, so that riders could change their horse! Many more ideas for a tunnel were proposed during the intervening years, with exploratory digging work actually being undertaken as long ago as the 1880s. 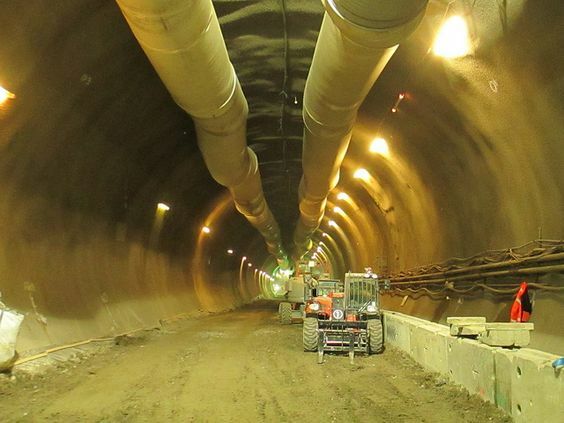 However, despite official agreement for a cross-Channel connection being reached between the UK and France in 1964, various political and economic issues meant that the first tunnelling for the completed project did not begin until nearly 25 years later, in 1988. Given the daunting scale of the engineering project, however, the work was completed comparatively swiftly, with the first cross-Channel train journey taking place on 6 May 1994 (although it was actually two years behind its ambitious schedule and, unfortunately, cost double the original estimate). 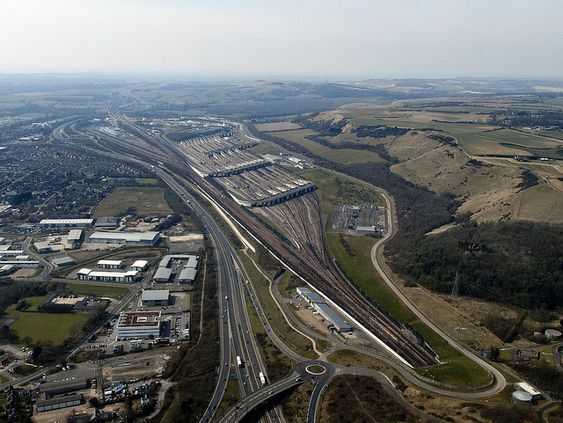 As would be expected for such a massive undertaking, a consortium formed of an array of construction, engineering and finance companies was given the task of coordinating and undertaking the work required to make the Channel Tunnel a reality. TransManche Link (commonly abbreviated to ‘TML’) was made up of a roughly even split of British and French companies, including the likes of Balfour Beatty, Costain, Bouygues S.A. and Banque Nationale de Paris. As it was the biggest project of its kind to have ever been attempted, it is no surprise that the Channel Tunnel’s development process was not always entirely smooth. It was not long until the relationship between the consortium and Groupe Eurotunnel (now known as Getlink), the company that would have responsibility for managing and operating the tunnel, began to sour, with arguments about costs and related issues becoming increasingly bitter and public. However, it was not long until the tunnel was finished and the final construction was almost universally regarded as a success. It may have taken nearly 200 years between the idea’s initial conception and its fruition but the wait for the Channel Tunnel was certainly worth it. Quick fact: Over 10.5 million passengers travel on the Channel Tunnel each year. The United Arab Emirates city of Dubai has, in recent years, become a global symbol of ambition and progress. Pioneering constructions such as the Burj Al Arab hotel (designed to look like a ship’s sail) and the artificial Palm Islands have made headlines around the world and contributed to Dubai’s burgeoning popularity as a tourist destination. However, it is arguable that none of the city’s ‘megaprojects’ have as much cultural significance nor are as widely discussed as the Burj Khalifa skyscraper in Downtown Dubai. The building, which opened at the start of 2010, remains the tallest in the world and is a physical embodiment of the UAE’s desire to make a global impression and truly stand out in both the business and leisure sectors. Headed up by the construction branch of the Al Ghurair investment company, the building of Burj Khalifa commenced in 2004 and was finished less than six years later – an impressive feat, given the fact that no structure like it had ever been completed before. Despite its cutting-edge modernity, Burj Khalifa’s appearance was inspired by the traditional Islamic architecture found throughout the region, particularly the spiralling minarets which adorn many places of worship, such as the Great Mosque of Samarra. Burj Khalifa has been positively received by architectural critics around the world – perhaps surprisingly, when its sheer unconventionality is taken into account – and the building has received many awards for its design. Regardless of the engineering brilliance required to complete it, however, the project has not been without its critics. 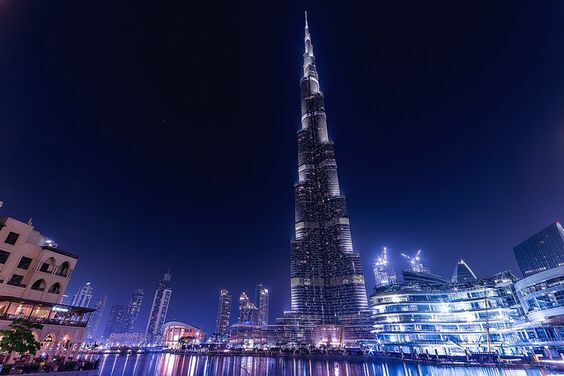 Some observers – including the Council on Tall Buildings and Urban Habitat (CTBUH) – are not keen on the substantial ‘vanity space’ which constitutes Burj Khalifa’s spire. A study by the CTBUH revealed that no functional space would be lost if as much as 244 metres were removed from the building’s height. Quick fact: Burj Khalifa is home to the world’s highest nightclub, restaurant and New Year fireworks display. Engineering technology has come a very long way in the last fifty years or so, which makes the successful completion of Hoover Dam in 1936 all the more extraordinary. The dam, which borders the US states of Arizona and Nevada, is perhaps the ultimate example of a project being successfully undertaken despite facing obstacles of epic proportions, including the use of untested technology, unhelpful weather conditions, a lack of nearby infrastructure, a weak national economy and, by no means least, significant political and public scepticism. 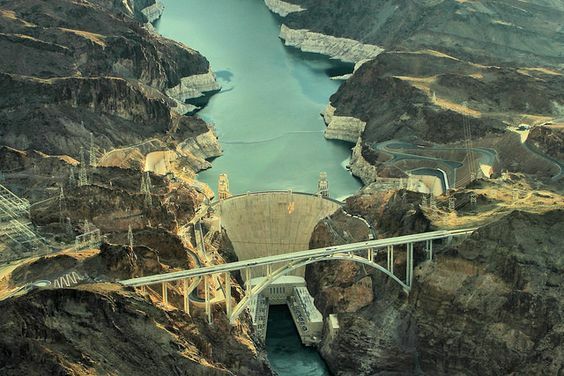 Despite all of these hurdles, however, the Hoover Dam project exceeded all expectations, opening over two years ahead of the official schedule. In the early 1930s, America was in the throes of the Great Depression, with unemployment and national morale at perilous levels. The dam’s construction proved to be a much-needed boost to the labour force, with thousands of unemployed men flocking to the site of construction in search of work after learning that this major infrastructure project had been approved. At its peak in 1934, Hoover Dam had well over 5,000 people on its payroll. Working conditions being what they were in the 1930s, however, construction of the dam was not the risk-free experience that such projects generally now are in the western world thanks to more effective health and safety assessment. It is reported that at least 112 labourers perished before the project was completed. A memorial to commemorate the lives lost at the site is based around the words: “They died to make the desert bloom”. Despite this tragic loss of life, Hoover Dam is rightly regarded as one of the world’s most significant modern engineering projects and has now even become a major tourist attraction, visited by almost one million people annually. Quick fact: The naming of Hoover Dam caused great controversy. Many of President Herbert Hoover’s opponents did not believe that the structure should have been named after someone they believed to have failed during his time in office; the original name of ‘Boulder Dam’ was supported until the matter was finally settled in 1947. It would be no exaggeration to say that even the mighty Hoover Dam pales in comparison to the amazing construction achievement which is the Great Wall of China. Unlike most of the other projects discussed here, the Great Wall was not a finite project which had simple start and finish dates of construction. 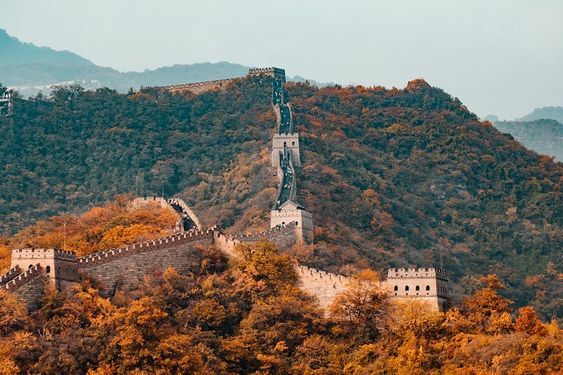 The need for a defensive wall first arose during the ‘Warring States’ era, which saw various Chinese regions grapple for dynastic control of the country; the first building work was carried out by individual states between the 8th and 5th centuries BC. The vast majority of the wall’s ancient remains are no longer in existence, however, and the bulk of the structure which we are familiar with today coincided with the comparatively recent Ming Dynasty, which lasted from 1368-1644. In 2009, a new survey established that the Great Wall’s total length stretches to no less than 5,500 miles, which should be reason enough to understand why the structure is regarded as one of the most noteworthy and deeply impressive architectural projects to have ever been completed. Like so many historic landmarks, however, today’s wall faces an uncertain future. Unfortunately, a lethal combination of graffiti, vandalism, theft, erosion and removal due to later construction projects means that much of the wall is now either in poor condition or has disappeared completely. Hopefully, conservationists will be able to reverse this trend in the years to come. Quick fact: The historical claim that the Great Wall of China can be seen from the Moon is a complete myth. To put the distances in question into perspective, looking at the wall from the Moon equates to trying to see a human hair from two miles away. Perhaps the only manmade structures which can rival the Great Wall of China in terms of its historical significance are the Egyptian pyramids. Instantly recognisable by people around the world, these magnificent constructions are a demonstration of the incredible architectural feats that were completed in the ancient world, despite the absence of any tools that we would now consider to be sophisticated technology. Over 100 of these icons were built in Egypt, with the earliest thought to have been constructed over 2,500 years BC. The pyramids, most often used as extravagant burial monuments for the country’s ruling pharaohs and their close relations, are believed to represent the primordial Benben mound which – according to ancient Egyptian religion – played a pivotal role in the creation of the world. For many centuries, debate has raged over whether those who carried out the gruelling physical labour necessary to complete the pyramids were slaves or willing, paid workers. 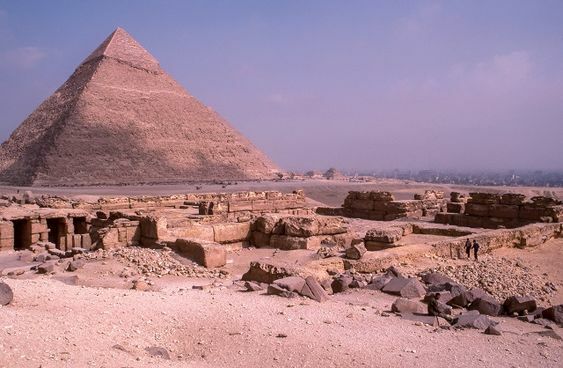 Experts now believe that it was the Greek historian Herodotus, who lived in the fifth century BC, who first hypothesised that the pyramids were built by slaves; his account, however, has since been widely discredited. The most commonly perpetuated theory now is that the pyramids were, in fact, built by labourers – often agricultural peasants whose regular employment was affected by floods and inclement weather - who either received salaries or were working in lieu of paying taxes. So impressive was the construction of the pyramids that archaeologists and historians have still not settled on a definitive explanation of how they were constructed. To this day, experiments are conducted and new hypotheses proposed concerning the finer points of, for example, what kind of ramps were employed and the origin and composition of the stone used. Quick fact: The largest and most famous of the Egyptian pyramids is the Great Pyramid of Giza; it is the only one of the Seven Wonders of the Ancient World which remains mostly intact. 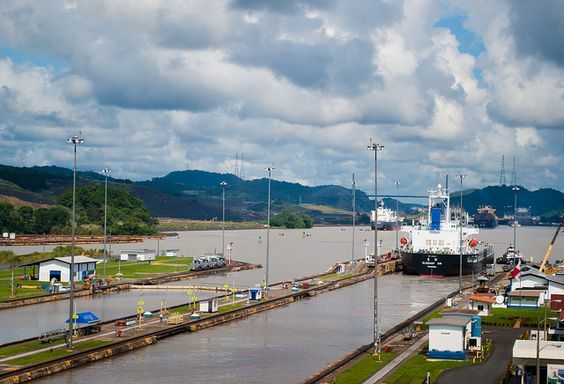 From one of the wonders of the ancient world to one of the modern era – the Panama Canal, a 48-mile waterway connecting the Pacific and Atlantic Oceans. The fact that the canal extends over such a large area and does not boast the same distinctive, easily identifiable features as most of the other landmarks discussed here probably contributes to it not usually being referred to in the same glowing terms as the likes of Hoover Dam. However, there can be little denying that the Panama Canal is not only one of the most ambitious and complex civil engineering projects to have ever been completed - it is also among the most valuable in a practical sense, remaining a vital and frequently used passage for all manner of vessels (and of particular importance to cargo ships). Much like the Channel Tunnel, the Panama Canal has had a long and interesting history in terms of the journey between its initial conception and eventual completion. The first recorded proposal for such a waterway dates back to 1534, when Charles V of Spain ordered surveys to be undertaken regarding whether it could be made easier for ships to travel between Spain and Peru, largely because of the tactical advantage this would have given the Spanish military over their Portuguese foes. As with many projects of this scale, however, the road to completion was not a smooth one. Several attempts were made to construct a canal in the intervening years; by far the most disastrous of these was an effort led by the French diplomat, Ferdinand de Lesseps. Appallingly, this misguided venture cost an estimated $287,000,000, bankrupted around 800,000 investors and – most shockingly of all – led to roughly 22,000 deaths. The project was eventually taken over by the American government in 1904 and, although some further difficulties were encountered (perhaps inevitably for a project of this size), the canal was finally completed after a relatively swift 10 year construction effort. Quick fact: When the canal opened in 1914, 1,000 ships passed through it. By 2008, the annual figure had risen to nearly 15,000. The next project on our list is the only one which has yet to be completed, but it is still very much worthy of discussion. Crossrail is the name given during construction to the railway line which will, upon completion, be known as the Elizabeth line. It will provide a new service running east-west through London, allowing passengers as far west as Reading and as far to the east as Brentwood to benefit from much quicker and more convenient access to the centre of the capital. The largest current infrastructure project in the whole of Europe, Crossrail will run for a total length of 73 miles and has necessitated the building of 13 miles of twin tunnels beneath the surface of central London. The ability to carry out highly reliable, pinpoint precision engineering is, of course, a prerequisite for anyone tasked with carrying out major infrastructure work, and these skills have certainly been put to the test during Crossrail’s construction. The best example of this is the so-called ‘Eye of the Needle’ spot below Tottenham Court Road station, which saw the new Crossrail tunnel pass between existing underground and escalator tunnels with less than a metre’s clearance to spare! Ask any commuter in London, and they are likely to confirm that there is most definitely a need for increased capacity on the capital’s rail network. Easing the pressure on the overcrowded Tube system was a major factor in Crossrail’s approval and development, and the benefits that it will bring to the Central, District, Jubilee and Piccadilly lines will be eagerly awaited right up to the Elizabeth line’s planned opening date of December 2018. Quick fact: When he was the Transport for London Commissioner in 2015, Sir Peter Hendy predicted that the demand for extra commuter space is such that the Elizabeth line will be “immediately full” upon opening. New York City is among the most iconic locations in the world, and is quite possibly home to more famous landmarks per square metre than any other. One of these – and certainly one of the most significant from an engineering point of view – is the wonderful Brooklyn Bridge. The suspension roadway bridge, which connects the boroughs of Brooklyn and Manhattan, was among the first of its kind to be constructed in the US and was designated as a National Historic Civil Engineering Landmark in 1972. The conception, design, development and execution of the bridge can largely be attributed to the extraordinary drive and ambition of one family: the Roeblings. John Augustus Roebling had already overseen the construction of several other suspension bridges before he began work on the Brooklyn project in 1869, and it was his vision that was eventually brought to fruition by his son, Washington, and the latter’s wife, Emily. Sadly, the patriarch of the Roebling family did not live to see his project completed. In 1869, John Augustus had his foot crushed by a ferry whilst conducting surveying work at the future site of the bridge. He then developed a tetanus infection and died a little over three weeks later. 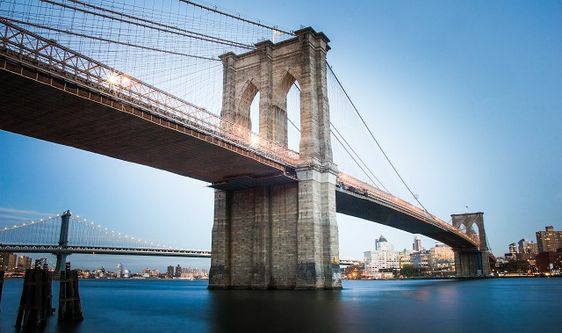 Upon its completion in 1883, Brooklyn Bridge was hailed as a symbol of optimism and aspiration in the field of engineering, and it remains so today. In 1995, the essayist John Perry Barlow summarised the bridge’s construction as a “literal and genuinely religious leap of faith”. Quick fact: From 1876 until the end of World War II, a series of vaults under the bridge’s Manhattan anchorage were intermittently rented out as wine cellars. In 1978, a journalist discovered a fading inscription in one of the vaults reading: “Who loveth not wine, women and song, he remaineth a fool his whole life long”. The penultimate landmark on our list may not, at first glance, seem to be the world’s most awe-inspiring feat of engineering, and it is certainly not the most famous. 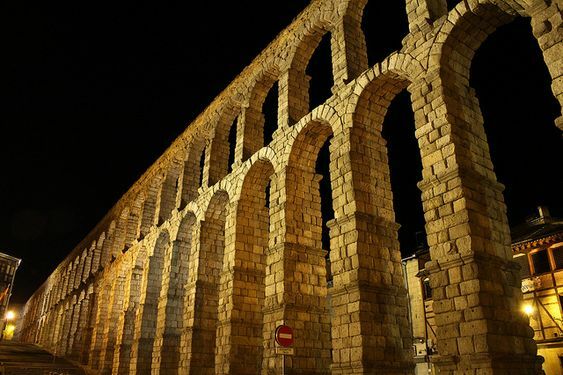 Nevertheless, the Aqueduct of Segovia in Spain is a notable achievement and, more importantly, a wonderfully intact example of the kind of infrastructure the legendary Roman Empire was capable of producing. Aqueducts – watercourses designed to provide fresh water for drinking and use in public baths - are a demonstration of the technical brilliance and resourcefulness of Roman engineers, and anyone who visits Segovia should certainly take the opportunity to marvel at what is one of the best-preserved remaining examples. The Aqueduct of Segovia’s construction date was a matter of debate for centuries. As recently as 2016, however, research indicated that the aqueduct was most likely to have been built in 112 AD. Quick fact: The aqueduct has been cherished and extremely well maintained by the many generations which have come and gone following its construction. It even continued to provide water to Segovia until the middle of the 19th century. It should come as no surprise that the final engineering project we will discuss is in China, one of the world’s most fiercely ambitious and commercially-minded countries. 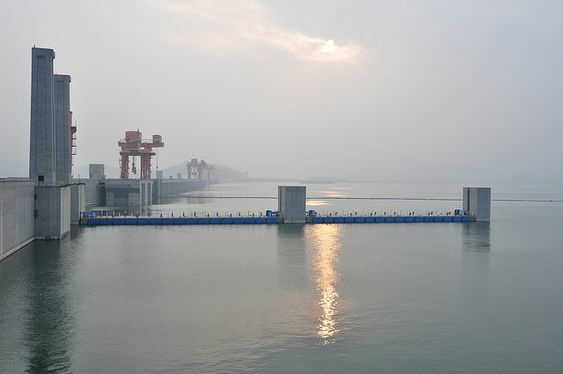 The Three Gorges Dam, which spans the Yangtze River near the town of Sandouping, is officially the largest power station in the world and produces a huge amount of electricity annually. To date, its most productive year was 2014, when 98.8 terawatt-hours were generated – at the time, a world record. Construction on the dam began in 1994, with electricity production starting in 2003. Since this date, however, many more turbines have been installed at the site – rising to 32 from an initial 6 – meaning that generation capacity has grown exponentially. The amount of concrete and steel required to build the dam is truly mind-boggling. To put things into context, the dam (which stretches to 410 miles long) contains enough steel to build 63 Eiffel Towers. Quick fact: Scientists from NASA have claimed that the huge amount of water that has been shifted by the dam means the structure could lengthen the Earth’s day by 0.06 microseconds.